Raw Food Week, Day 5 - Crochet, Starbucks and roadtrips, oh my! Breakfast: a big orange-sized tangerine (with eighty bazillion seeds), a kiwi, and a handful of almonds. OMGYUM. That's all I have to say about that. Granted, it wasn't 100% raw (it had maple syrup in it, and I'm pretty sure the peanuts in the peanut butter are roasted) but was it ever good. 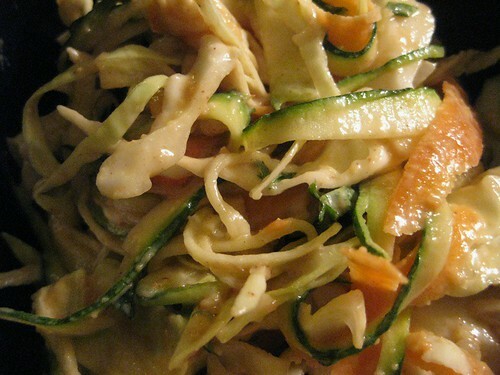 And zucchini noodles taste like real noodles. It's weird and wonderful. I ought to try some of these recipes. And raw desserts -- we did buy 10 kg of dates a few months ago, although we've eaten quite a few since then. BTW, all the food you've written about sounds FABULOUS!! You already do a pretty good job with your food! !